The tourism economy now supports 450 000 more people than when the Business Trust programme started. The Business Trust Tourism Programme was established to stimulate employment by accelerating the development of South Africa’s under-exploited tourism sector. When the programme was designed in 1998, 35% of South Africans aged 15 to 30 were unemployed. Tourism contributed 4% to GDP while for comparable countries the figure was 10% or more. This sector’s job creation potential far exceeded that of any other. The challenge was to realise that potential. The strategy adopted by the Business Trust was to work in partnership with the Department of Tourism to improve the marketing of the country as a tourist destination, develop skills to improve service, help small enterprises to expand employment, and overcome two of the critical impediments to tourism development – crime and malaria. 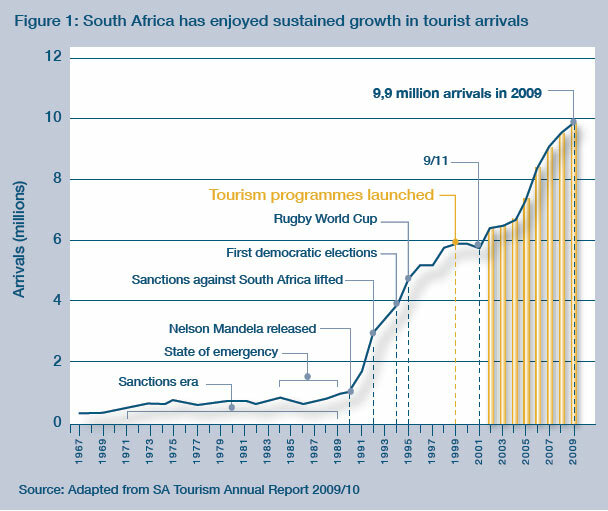 Tourism is now one of South Africa’s leading economic sectors. It contributed close to 8% (7,9% according to the world Travel and Tourism Council) to GDP in 2010 and employed more people than the gold mining industry. The tourism economy supports 450 000 more people than when the Business Trust programme started. This 11-year programme, worth R748 million, was the largest managed by the Business Trust. R436 million of the funds managed came from the Business Trust’s corporate partners and R312 million from the Department of Tourism. The highlights and the lessons learned are summarised below. By 2009 the number of foreign arrivals had grown to 9,9 million from 6 million in 1999. Jobs supported by the tourism economy had grown by 450 000 to 1,4 million according to the World Travel and Tourism Council. South African Tourism was dedicated to achieving the marketing strategy objectives. That ensured sustained commitment. The Tourism Learnership Programme undertaken in partnership with the Department of Labour trained over 25 000 people, 3 600 of whom were unemployed. 7 800 enterprises were helped to undertake R5 billion worth of work. TEP clients have kept the equivalent of 6 000 people in work for over ten years. The Business Trust seed funding of R18,5 million helped launch the malaria control programme in South Africa, Swaziland and Mozambique. By 2004 the Malaria Control Programme had sprayed 537 613 structures and trained 944 personnel. The Business Trust seed funding of R18,5 million helped launch the programme in South Africa, Swaziland and Mozambique. A decade later the programme has raised some R250 million in global funding and dramatic reductions in malaria have been seen throughout the region. 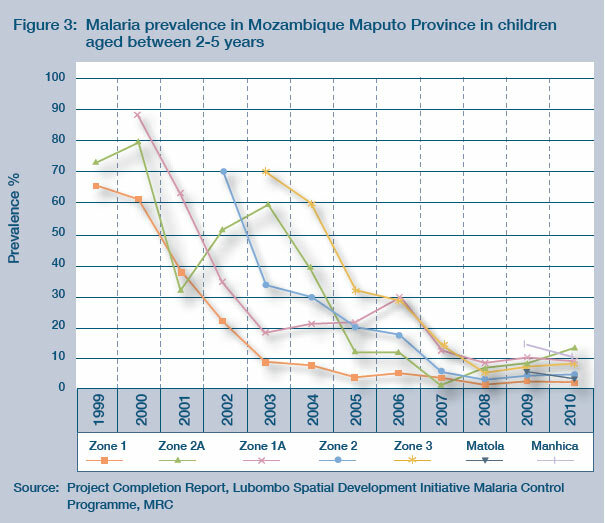 For example, in Maputo Province malaria prevalence among children under 15 years of age has declined from 60% to less than 10%. South Africa is on course to eliminating malaria by 2018. By 2004 the work supported by the Business Trust to improve the effectiveness, swiftness and efficiency of the justice system showed progress at pilot sites. The long-term R2 billion investment by the government to modernise the criminal justice system has integrated business processes throughout the system and automated finger print identification. Fingerprints that were stored on 4,5 million index cards are now digitally captured. The selection of tourism as a growth sector in which South Africa had a competitive advantage and the potential to create jobs gave the programme a better chance than those programmes that try to swim upstream. Clear political leadership with a commitment to a productive relationship with business was central to the success of the programme. Corporate leaders were willing to commit their time and resources where there were productive relationships with government and a clear plan was in place. The introduction of highly skilled advisors was the turning point in the production of a globally competitive strategy. Having South African Tourism dedicated to achieving the objectives of the tourism marketing strategy ensured sustained commitment. The availability of discretionary funding through the Business Trust provided the flexibility to trigger actions that led to the expansion of the tourism sector. For Tourism Publications please click here.